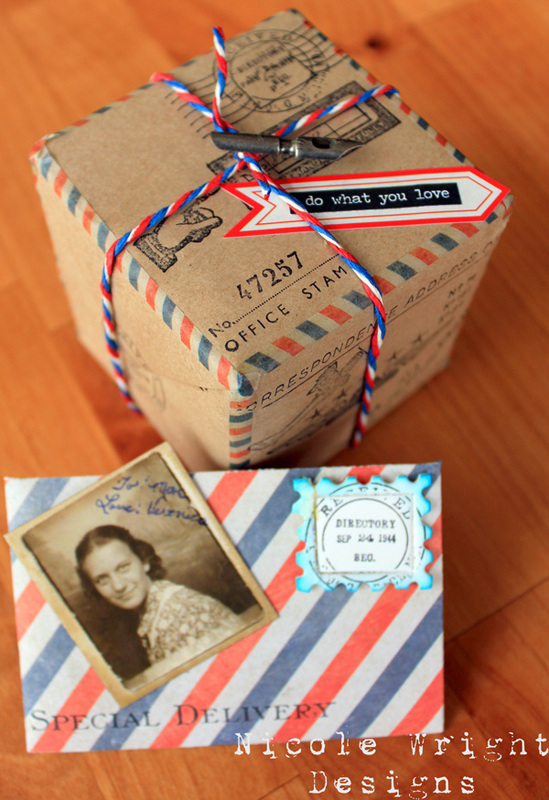 Ice cream to indigo blue stamps, and ink to ice resin – this week the letter i is our inspiration! How will you be inspired this week? I think that I’ll find all kinds of interesting inspiration from this letter! Andrea wanted to create trophies for the intelligent individuals in her life. I love people who know stuff, but don’t have to prove that they know stuff. 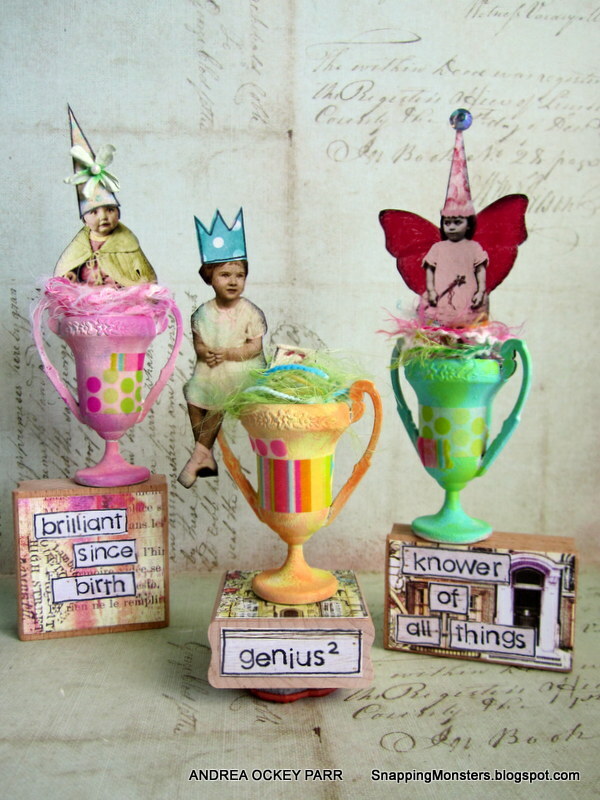 These humble super geniuses deserve the highest kudos, so I made some trophies for them using Tim Holtz’s Trophy cups that I painted with Dina Wakley’s acrylic paint and Distress Paint. I love inks and spray inks are lots of fun to play with in my art journal. To create some texture for some interest, I gessoed the surface and applied some Crackled Texture Paste with the Honeycomb Stencil. Love the crackle effect, and by spraying with some Ink Sprays like Glimmer Mist and Cracked Pistachio, the effect gets more intense. Michelle was screamin’ with this “I” challenge. Occasionally, the first project doesn’t work out as planned. 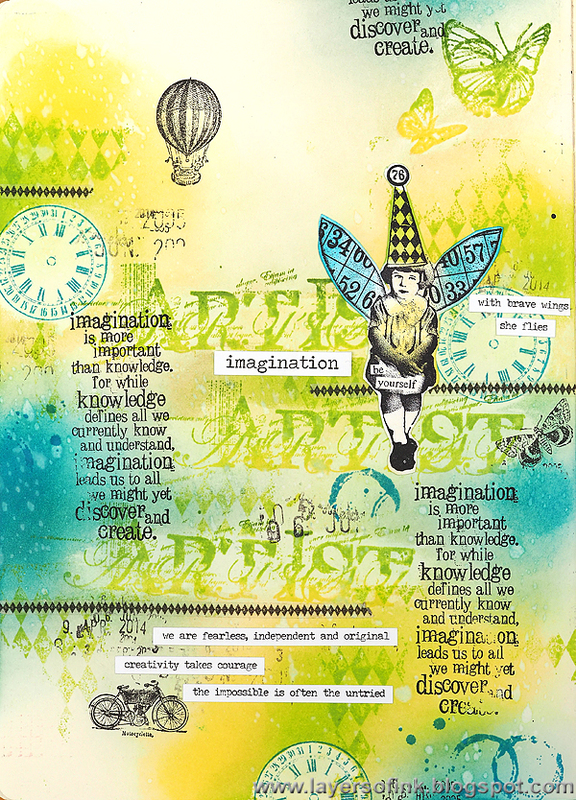 The cute-as-can be Carta Bella Stencil provided a great place to scribble out frustration and soon the second project evolved into a collaged art journal entry with lots of stamped and watercolor papers. The second time’s a charm! 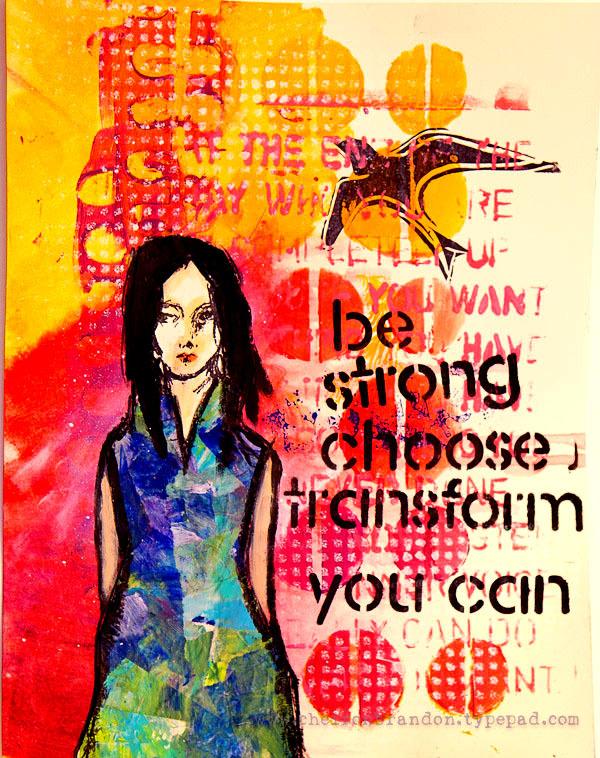 Cheiron created this page in her art journal featuring an independent woman. I love all of Dina Wakley’s stamps especially the girls from the Face In The Crowd set. What I love about them most is their sense of independence, and the way that it is so easy to change their look in my mixed media projects. I gave this gal a new look with some clothing made with deli paper that was colored with lots of Dina’s stencils and paints. Suzz was itching to ink up some inchies. I had the iron out looking to use it on my project this week, but as usual the iron sits collecting dust. Instead I created a series of inchies which were very much inspired by Andrea. I am always in awe of Andrea’s whimsical colorful and beautiful art each week. 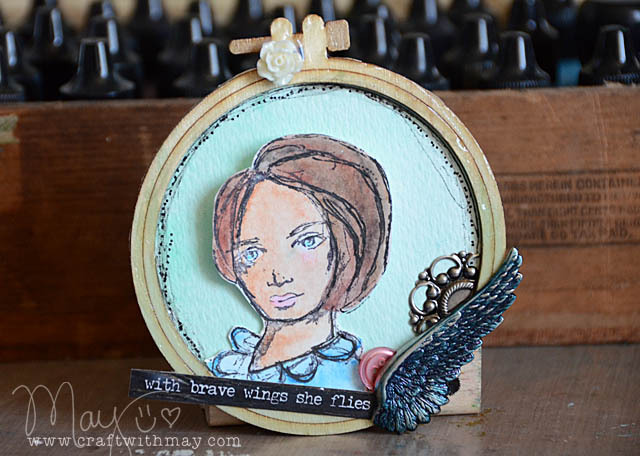 I tried to emulate her style in my little inchies by bring pops of color using the Heidi Swapp Color Shine sprays, a variety of stamps and stencils. The house my inchies are built on is the Impression Obsession House Frame. The finishing words are from the Idea-Ology Remnant Rub-Ons. I (May) had a lot of ideas. Inks? Eyeballs? Indigo? I took out some face stamps (thinking I/eye) and started playing with a little craft hoop and just let things happen! I’m loving how this little piece turned out – it will soon be hanging on my studio wall. Maura altered her iPhone box. I am a big steampunk fan and love to work with metals and gears, and my iPhone box has been taking up space, so I thought, why not turn it into a cool treasure box! Dina Wakley’s Penny and Gilt paints are perfect for creating a metallic finish. 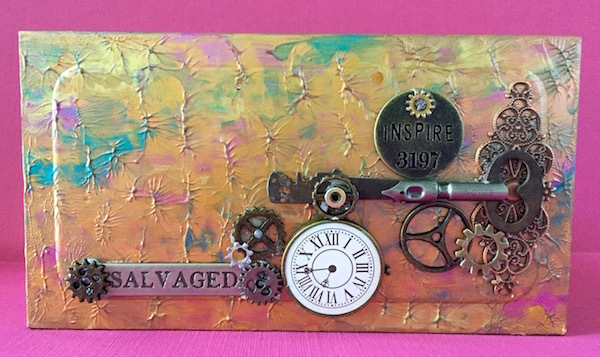 Of course, some Tim Holtz ephemera is needed, like gears and and a word band. 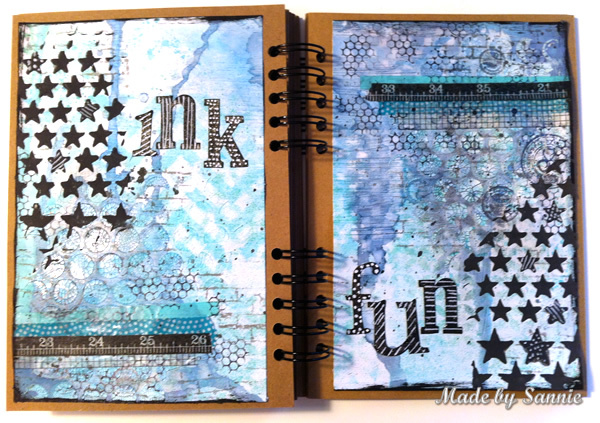 Anna-Karin made a very inky journal page. It is no secret that I love ink, and this page is all about the ink. I used Distress Inks to create my background and also had fun making my own custom coloured ink pad. 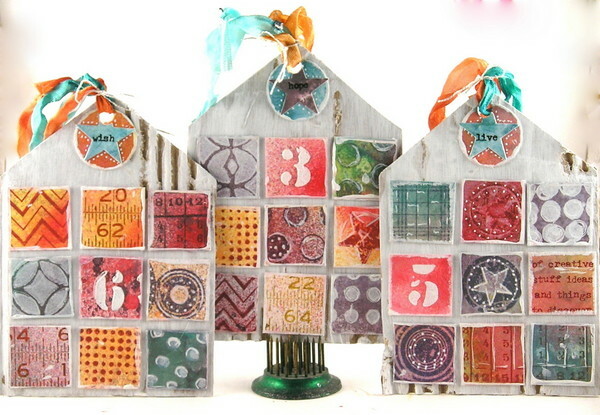 The page was built up with stamps by Tim Holtz and I played around with the new Distress Micro Glaze for a resist effect. Nicole was chilled by this challenge. There are so many ways you can go with this challenge but I was stuck with “icy” thoughts. In the end I got there when I was looking at my Airmail Paper String and Pen Nibs. I’m always inspired by my Idea-Ology. They always make a great addition to anything I create. Ashli doesn’t need to be told twice to indulge in some Ice Cream! I love ice cream! Oh yes… so, this week, I just had to play with creating some ice cream of my own, complete with a stamped present on top! 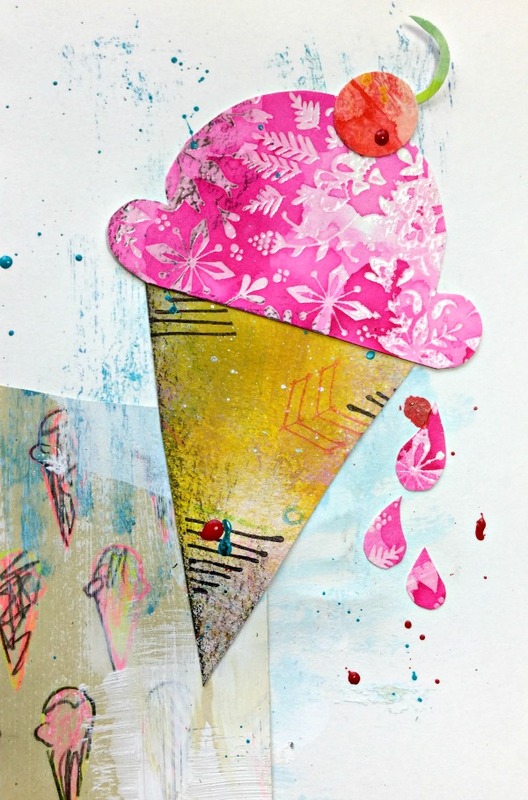 Using a favorite floral embossing folder, along with a polka dot one, I crafted up my scoop and cone. 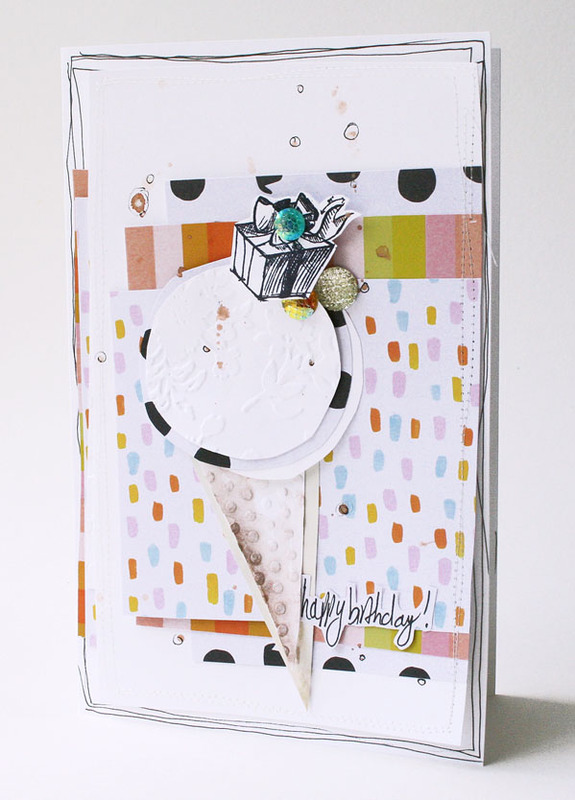 Some pretty papers and a bit of watercolor finished off this happy birthday card! Emma‘s inspiration came from a world of pure “imagination”! Inspiration and imagination is a very important part of my every day creative life and with this in mind I made a panel using Tim’s gorgeous world globe die that created a glistening and shimmering focal point on a background of Distress Paints, micro beads and texture paste. To complete the panel, I added wording using Alpha Parts and Big Chat stickers. Meihsia was inspired to create an “I heart U” art journal page with some Iced Enamels. I have some Iced Enamels and I think they are perfect for this week’s theme. After creating the background with Distress Paints and Distress Spray Stains, I decorated the page with Prima Flowers Resins and Tim Holtz Embellishments. The Iced Enamels were added to finish off this project. As always, Simon Says Stamp is giving away a $50 gift voucher that will go to a random entry chosen by random generator. To qualify all you need to do is create a new project that ties in (in any way!) with our theme and post it, along with a link back to this challenge, and add a link here. This challenge will end at 11:59pm on Sunday July 26th Eastern time. We will also be choosing some of our entries to put in the spotlight – a special honor where we talk about why we loved that entry in particular and award a special badge too! For the full rules, read the “challenge rules” posted in the side-bar here on our blog. I’m having so much fun with your Mondays challenges thankyou! Fantastic challenge. I always love how imaginative your samples are. Amazing inspiration as always. Thank you ladies. The Letter “I” is such a fun idea for a challenge!! Thanks for all the amazing ways you inspire me to try new things!! !